If you drive a car in Chile, you’ll need to visit a gas station. Here’s what you need to know to make that first visit to a Chilean gas station as smooth as possible. 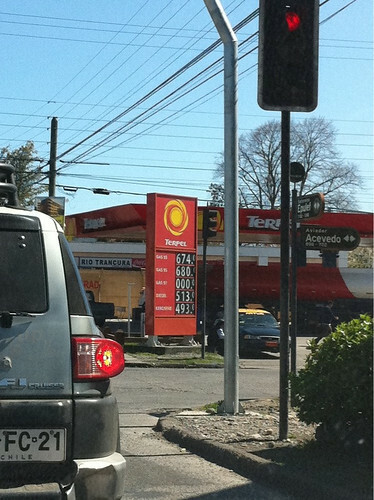 Gas stations in Chile aren’t on every corner so if you need gas, you should stop when the opportunity presents itself. Chile has many different brands of gas stations. The most common you’ll see are Copec (Chilean company), Petrobras (from Brazil), Shell (a Dutch company), and Terpel (Columbian company). Each station will have attendants in brightly colored uniforms that match the company’s logo. At first glance, the workers look like they belong in the pit crew of an auto race. These attendants are called bomberos, not to be confused with a Chilean firefighter, even though they share the same name. Most gas stations are full-service stations unless you see a sign for auto servicio and even then, a bombero may come over to help fill up your tank. When you pull into the station, the bombero will ask how much gas you want. You can tell him in liters, pesos amount, or say lleno to fill up your tank. Next he will ask what type of gas. Most of the time this choice is between 93/95 octane unleaded fuel or diesel. It seemed that diesel fuel is always cheaper than unleaded. Make sure you know what your car needs and ask for the appropriate type. Once the bombero knows how much you need and what type, he will point to the pump so you can verify it reads all zeros before he starts filling it up. This is so you can verify that you’re not getting ripped off. The bombero may ask to wash your windows, check the oil, etc. If you don’t want any of those services just say no, gracias. Some bomberos will wash your windows without asking. Cash is always accepted at gas stations. Be sure you have Chilean pesos on hand to pay if you want to use cash. 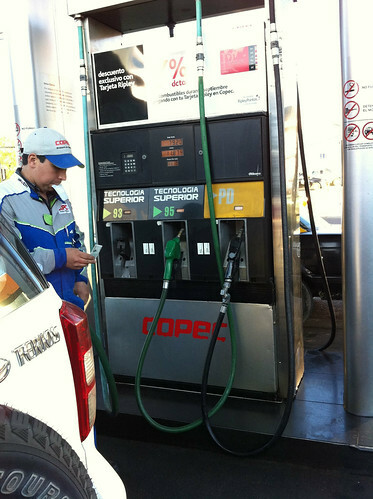 You can use your foreign credit card at major gas stations in Chile. Look for the tell-tale signs that credit cards are accepted, like the RedCompra sign. I’ve found that the attendants are often more comfortable with credit cards than cashiers at some retail stores. It is customary to tip the attendant a few monedas or coins for helping you with the gas or cleaning your windows. So even if you pay with credit card, have a few coins in your pocket for tips. One thing that threw us off was that, when we paid by debit/credit card, they run the card in a little handheld device, and always asked us “cuenta?” The device’s display showed “con cuenta” and “sin cuenta” as options. Is this asking whether it is a debit or a credit card? We couldn’t find anybody who could answer that. The only one who came close just said, “sin cuenta” and that was that! Also, “full service” rarely included anything other than putting the nozzle in the gas tank and presenting the bill. Only once, during the entire month we were there, did someone volunteer to wash our windows (which were noticeably filthy! We did a lot of driving through muddy areas!) and one other time someone checked our fluids. Both of them got a tip from us. A couple of times, I asked the attendant if they would wash the windows. They looked confused (and maybe even a little offended!) and just pointed to the car wash. At one place in La Serena, I even asked for the wiper, so I could do it myself, and the guy just pointed to the car wash that was obviously closed. “Full service” in Chile is completely useless. It’s a waste of time and money with little to no added benefit. For reference, when we left (August 2013) gas was 870 pesos per liter – with the exchange rate, that translates to $7/gallon. Insane! @Jamie – thanks for sharing the details of your trip! For credit cards, they were asking you about “cuotas”. They want to know how many payments/installments you want your charge split into. You answered correctly with “none”.